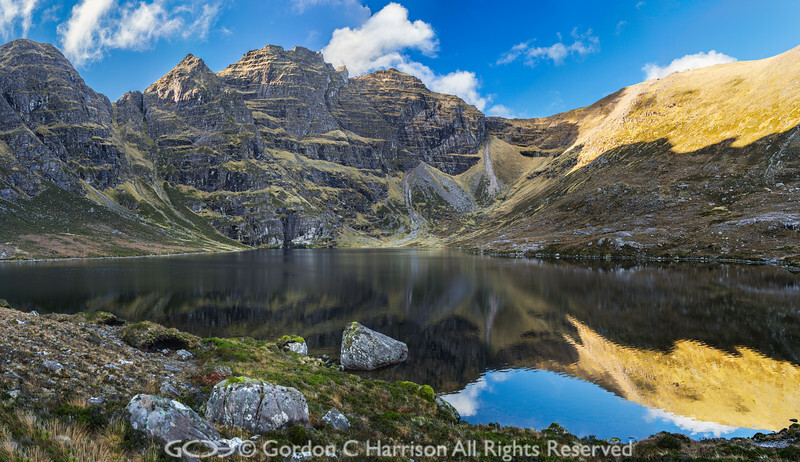 Situated beneath the An Teallach Ridge is Loch Toll an Lochain, a place which fills me with awe each time I visit it. This day was so beautiful my hope was that the ridge above the loch would be cloud free. My walk to reach this point took much longer than planned due to 'irresistable' photo opportunities en route. How often have I told myself I must be more disciplined and not be sidetracked! To end the day I had planned to take a new trackless route off the hills but due to my taking longer than planned to get to Loch Toll an Lochain, plus my inclination to linger there much too long, I reckoned that I would need to do much of it in the dark - not a good idea on a new route. I decided to leave the new route for another day and made my way to the Shenavall track which I could easily walk in the dark (with a headlight) back to Corriehallie.